Standard air conditioning devices do exactly the opposite, pulling moisture out of the air. Drier, cooler air is then pushed out of the compressor and into the room while the warm air is dumped outside. Since they need a closed environment, AC units allow for complete control over the temperature while swamp coolers do not. Swamp coolers come in many shapes and sizes. You can opt for a portable device that requires no installation at all, but these smaller units can be less efficient. A larger swamp cooler needs a water hook-up, but can be connected to ductwork so every room of your home is the same temperature. Whether you choose an evaporative cooler or an air conditioner, it’s best to contact the experts beforehand. They can do a proper assessment of your home and find out what unit best fits your living space. Most larger units require HVAC professionals to install. 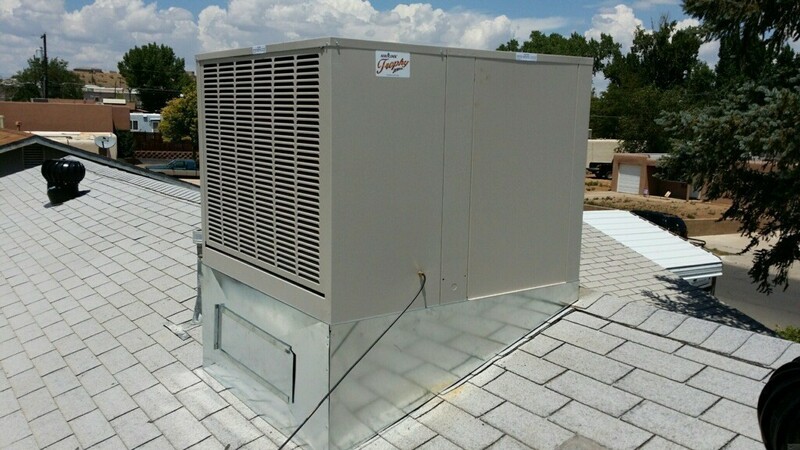 Evaporative coolers require a lot more care than their air conditioning counterparts. The unit must be drained and cleaned often since minerals and sediment build up inside. The pump, filters, and pads all need to be checked monthly, especially if the unit sees a lot of use. Air conditioners require less effort and work fine with a yearly service. Make sure you don’t cut corners with maintaining your air conditioning unit; it will keep it running for much longer and spare you from replacing expensive parts. Unlike traditional AC units, swamp coolers work without any chemicals that can be harmful to the environment. Swap coolers are by far more energy efficient as they need roughly a quarter of the electricity that an AC unit needs, though their dependence on water means they won’t run very well in areas affected by drought.